Rotarians Peter Orpen and Bashir Ahmed of Rotary Club of Brighton & Hove Soiree, UK spent a busy day in Lahore visiting various Rotary projects. In the morning, they went to Government Primary School Lucklines to see the development work done by Rotary Club of Lahore Garrison, which provided furniture, toilet facilities, playground equipment to the school and clothing, sweaters and shoes to the students. Later they visited LRBT Hospital which provides free eye treatment to everyone who goes there for treatment. Dr. Aqil Qazi and Dr. Khurram Mirza briefed them about the facilities of the hospital. 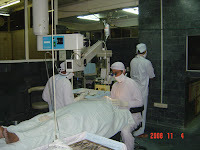 Rotary Club of Lahore Garrison has provided funds for the IOL surgeries for the poor patients. Rotary Club will also provide an ophthalmic operating microscope worth four million rupees. In the afternoon, the visiting Rotarians went to Shaukat Khanum Cancer Hospital where Naila Khan, Manager Marketing & Fundraising, informed them about the history of the hospital and its working. More than 70% of the cancer patients are provided free or subsidized treatment. District Governor Nominee Shehzad Ahmed informed that Rotary Clubs would be invited to plan and carry out Matching Grants to provide medical equipment to the hospital. Rotarian Masrur Lodhi also accompanied the visiting Rotarians in the Shaukat Khanum Cancer Hospital.